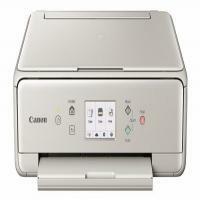 Canon Pixma TS6052 printer has contrasting textures, with rounded corners, and tapering contours. With 31.5 x 37.2 x 13.9 cm dimensions and 6.2Kg weigh, this compact and versatile printer is best suitable for small office and home. The Canon’s FINE inkjet print technology and 6 separate ink tanks save cost, bring convenience, and provide great-looking prints. To make the printing task easy in one go, Canon Pixma TS6052 printer incorporates wireless connectivity. Now one can easily print from a tablet or computer, or smartphone, with the support of Apple AirPrint, Mopria for Android, Google Cloud Print, and the Canon PRINT app for iOS and Android, plus multiple Wi-Fi options. The CREATIVE PARK software is an add-on, with this one can design and print calendars, photo collage, greeting cards, and stunning 3D papercraft animals, toys and landmark buildings. Pixma TS6052 printer has a simple user-friendly interface. One can easily navigate through the menu with the help of 3-inch touchscreen LED Display. Furthermore, it has good printing and a scanning resolution of about 4800 x 1200 dpi and 1200 x 2400 dpi. Versatility and flexibility are synonymous to Pixma TS6052 printer. Canon’s PIXMA TS6052, the all-in-one inkjet colour printer can fit into any corner of your home or office due to its compact size. Thanks to premium quality Canon Pixma TS6052 ink cartridges, one can easily get pristine prints of their memories or any important document. Dual feeder design allows feeding the photo paper and the normal paper at the same time. Moreover, wireless connectivity and easy-to-use touchscreen display provide effortless printing. It does not cost the earth! The one who is in search of a small all-in-one printer with wired and wireless connectivity options than this can be one of the best choices. How to print a nozzle check pattern? If your print results are not satisfactory and you are not able to determine whether the Canon Pixma TS6052 ink cartridges used are low on ink or the nozzles are blocked. Printing the nozzle check pattern will help you to decide whether the ink ejects properly from the printhead nozzle or not. Note: If the remaining level of the Canon Pixma TS6052 ink cartridges is low, the nozzle check pattern will not be printed correctly. In such a situation, one must replace the ink tanks. Load a sheet of A4 size or Letter-sized plain paper in the cassette. After pushing the cassette back, the paper information registration screen will be displayed on the touchscreen. You must select either A4 size or letter for page size, then click on register. If a message is displayed on the screen, follow the directions in the message to complete registration. Note: Make sure to load the paper properly in the cassette. If you load a paper on the rear tray, the nozzle check pattern will not be printed. Open the operation panel, then pull out the paper from the output tray. Select the setup tab on the home screen. By using the operation panel the setup menu screen will appear. Then, select the maintenance option. This will open up the maintenance screen. Choose printing the nozzle check pattern. Select the nozzle check option from the maintenance drop-down option and confirm it by clicking on the confirmation screen. Once you select yes, the nozzle check pattern will be printed and two pattern confirmation screens will appear on the touchscreen. Examine the nozzle check pattern printed and refer your online user manual for more information. Once you examine the nozzle check pattern, clean the printhead if necessary. If cleaning the printhead does not work, check if the Canon Pixma TS6052 ink cartridges used for printing are low on ink and need replacement. Q. Can using your compatible Canon Pixma TS6052 ink cartridges cause damage to my printer? A. Absolutely not! All our compatible ink cartridges undergo various quality tests in accordance to ISO standards so as to provide you with high-quality ink cartridges that will work as well as the originals with your printer. We assure you that, you will face no issues when using our compatible ink cartridges with your printer. Q. Why does my Canon Pixma TS6052 printer keep shutting down automatically after sometime? Tap on the “Setup” icon. Select “Eco” in the “Settings” menu. In the “Energy Saving Settings” menu, disable the “Auto Power off” option and click “OK”. Q. Are your compatible Canon Pixma TS6052 ink cartridges harmful to the environment? A. We promote using our compatible ink cartridges for the welfare of the environment. This is because our compatible ink cartridges are mainly manufactured from recycled parts which helps reduce overall wastage which is beneficial for the environment. Q. Can I print borderless images using this printer? A. Yes, Canon Pixma TS6052 printers are capable of borderless printing. Q. I do not have high volume printing needs. Should I go for individual Canon Pixma TS6052 ink cartridges or buy them in multipacks? A. Multipacks are more suited for users who have high printing requirements and need to replace their ink cartridges regularly. You should buy the ink cartridges individually as the ink cartridges may dry up if you store them for long. Q. How many sheets of paper can Canon Pixma TS6052 printers handle at one time? A. Canon Pixma TS6052 printers can handle up to 100 sheets of plain paper, and 20 sheets of photo paper at a time.